Polysafe have a wide range of concrete barriers for hire that can protect your property, control or prevent vehicle access and are available for hire at competitive prices. With mainland UK delivery possible, there is a minimum hire period of 4 weeks. Hiring our barriers is most cost effective if you have a short term requirement. Hiring barriers means you don't need to find storage space between jobs - concrete barriers are large and heavy. 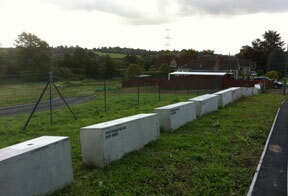 Flexibility - hire the right size concrete barriers for each job. Hassle free - concrete barriers are simply collected when off-hired. The barriers are manufactured to the highest standards in a range of sizes and variations to suit your needs.